Working out. Those two words alone can make anyone cringe. Just the thought of working out can make a person’s heart pound and body break into a sweat without even lifting weights. It can bring up such negative feelings and is one goal that is so easily ignored or pushed to the back burner on any given day. With schedules appearing busier, it’s getting difficult to find time to work out. Yet, even with busy schedules, we can all agree working out is a great and beneficial thing. Not only for ourselves but also for our children. We need to set the example that taking care of yourself is important. When we think about working out, oftentimes our first thought is a long, hard hour of hitting the gym with weights and using various cardio machines at least five times a week. What’s great is exercise can be tailored to everyone’s schedule and needs. 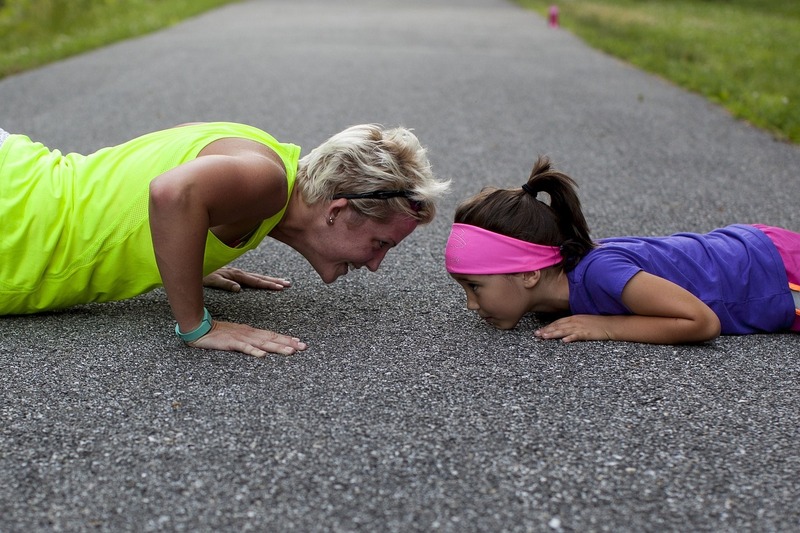 If you’re at home raising children who don’t exactly agree to give you 30-60 minutes of uninterrupted workouts each day, then finding time to squeeze in shorter workouts will be necessary. Planning your workouts while they’re napping, or playing in the other room or even after they’re down for the night might be your best “go” times. If those times don’t seem appealing, because maybe you have a list of other things to do, then another option could be to incorporate them into your workouts. That’s what many moms are beginning to do and though it can be a challenge, they’re finding it quite rewarding. Children are unpredictable, but if there’s one thing predictable about children it’s their love for playtime with mom and dad. By having them be a part of your workout it accomplishes three goals. Your ability to get your workout in. The kids see your example of health as a priority. Showing the kids that working out can be fun. When you open your mind to the idea of working out in places other than a gym or a designated room in your home the opportunities to exercise become limitless. Here are some examples of how to engage your kids in your daily exercise routines and how to take your workouts beyond your home and gym. Stroller users: If running with a stroller isn’t your thing, do lunges as you push your kids down the street. Stand off to the side, with one hand on the stroller, and do leg lifts. Lock the wheels with the stroller against a solid surface such as a picnic table, tree, or bench and do incline pushups against the tray. Added bonus: kiss the baby each time you do a pushup. Park goers: Instead of sitting on the bench watching the kids play, do step-ups on the bench. Too high? Look for a lower option around the area. Use the bench for squats or walk around the back and do inclined pushups. Play tag with your kids around the play area – get your kids involved in a helpful way to help expend their energy as well! Home dwellers: Do squats while emptying the dishwasher. Grab washcloths or paper towels and get the kids to help “clean the floors” with you as you get in a plank position and slide your feet forward, bringing your knees to your chest. Push your kids back and forth in laundry baskets. Jump over them back and forth, incorporating a high-five and a squat. These are just a few ways you can get in a fun workout. If you’re needing extra ideas and inspiration, check out these women who are honest about their workout journeys as they navigate through parenthood. No matter what season of life you’re in, remember, taking time to care for yourself is not only important for you, but important for your children who see you do so. The thought of working out in front of them or others in public might be embarrassing, but just remember the benefits outweigh the ten or twenty minutes of possible awkwardness. Besides, you never know who you might inspire to start working out with their kids. For more helpful and informative articles check out the Fill Your Plate Blog! New articles are posted every Monday, Wednesday, and Friday. Each article is full of informative material that will benefit your everyday life. This entry was posted in Diet Tips, Fill Your Plate, Health Tips, Healthy Eating and tagged Active, Family, Fun, Health, kids, Work out. Bookmark the permalink.